New Big Casein uses milk protein. High quality milk protein with a large concentration of casein micelles is the main raw material in the new Big Casein Protein Powder. Extra sugar and fat were carefully removed to formulate this raw material, leaving a peptide that supports calcium levels in the body and immunity. This unique processing method preserves the structure of this fragile peptide, enabling it to elicit its many powerful health benefits. 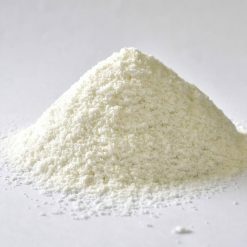 Big Casein Protein Powder contains glycomacropeptide (GMP). When the stomach is to sense the presence of GMP, sends a signal of satiety to the brain to stimulate the production of cholecystokinin. This hormone suppresses appetite. GMP also enhances calcium and zinc absorption, suppresses platelet aggregation in the arteries, and prevents hardening of the arteries. Casomorphins, once segregated from the casein micelles during digestion, will induce an opioid-like action in the body. Once it reaches the brain, it acts like a sedative to calm the mind. By reducing the motility of the small intestine, the food stays there longer, allowing more nutrients to be absorbed. Casomorphin has also been studied as a natural blood pressure control agent and found to have hypotensive action. In order to minerals such as calcium is absorbed, it is necessary to present as a molten state. Casein phosphodiesterase peptide (CPP) is kept in a state where soluble calcium, helps the absorption of calcium from the small intestine. Big casein is a time-released protein that is able to release the amino acid over a period of about 7 hours. It is suitable for protein supplementation before bedtime and between meals. ※ Natural is because it does not have added any such sweetness and flavor, will be the taste of the milk protein itself. Mix it into your favourite beverage and enjoy as is, or choose a flavored variety to make it easier to drink! Take one scoop mixed into 300-350mL of your beverage of choice (for caramel flavour, mix into 240-270mL of beverage).